It’s been 30 days since I arrived in Beijing and I have written 0 blog posts. My days have been filled with work, learning and exploration. For those of you who like maps, here is a visual representation of the journey. Reconnect with friends and local contacts in Kunming and Lijiang in order to strengthen my relationships with the Chinese people. Make a return to the Nanyao Village, the village I stayed in two summers ago and visited last summer. Interact with Chinese tourists and locals on the Yangtze River passenger boat. Make every single plane, train and boat (with time to spare )to avoid a complicated mess of rebooking. Write a blog post every night reflecting on the day’s events. Maintain the highest standards of safety, security and health throughout the trip. So there you have it. 3,212 miles is a lot to cover in six days, but I am glad I have chosen to take this trip. It will be great to reconnect with old friends in Yunnan and have some new experiences as well. I am happy that you, as readers, will also join me along this journey. Please feel free to comment with any questions or suggestions you may have. As I said in goal 5, I will attempt to write a blog post every night reflecting on the day’s events. Most of the time, it will include pictures, depending on the internet connection. Although I will be traveling to somewhat remote places, wifi access seems to be reasonably abundant, so I’m hoping I can keep the blog going over the next week. Stay tuned! Next stop: Lijiang. ETA: Saturday night China time. 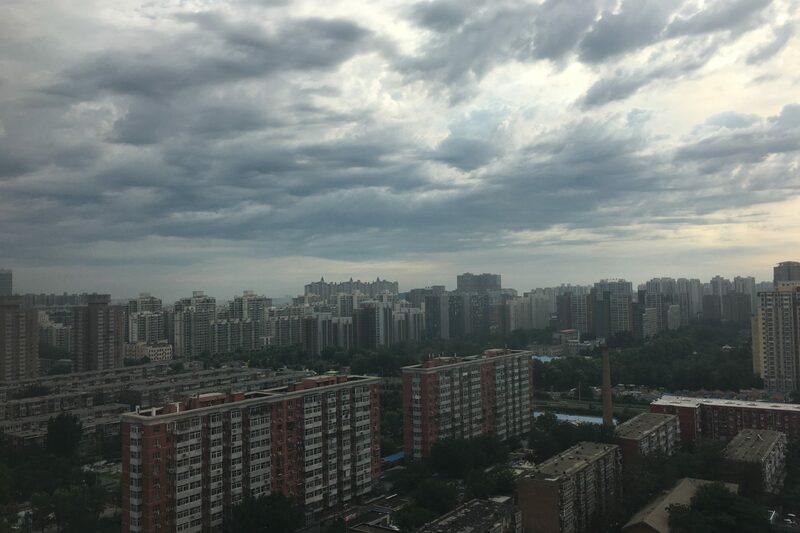 The photo above is the view from my apartment in eastern Beijing. While I’ll miss the view and egg tarts downstairs for breakfast, I know there will be many more exciting adventures and rich experiences ahead.